While in Delhi, fellow traveler Stein and I had booked train tickets for a journey to Amritsar in a couple of days. With a day in hand, we decided to go to Agra, home to the Taj Mahal. We joined an organized tour but only used it for the transportation portion of the trip. At sites of interest, we would wander around on our own before meeting up with the rest of the tour group at predetermined times. Sikandra, the final resting place of Emperor Akbar, was our first stop. Magnificently manicured gardens surrounded an elegant but understated tomb made primarily out of red sandstone, providing a preview of what to expect from the Taj Mahal but without the same levels of exquisite workmanship or opulence. Due to the damaging effects of pollution on the Taj's white marble surface only environmentally safe vehicles are allowed in its immediate vicinity. We took an eco-friendly bus to the gates of the monument to love. It was now time for the physical convergence of two of the world's most magnificent creations on the banks of the Yumana river. This rare event occurred when I entered the Taj Mahal complex. The sun reflected of the marble exterior of the Taj Mahal, the gentle breeze brought temporary relief from the sweltering heat, and the tourists busily snapped photographs as my silhouette was framed by the arch at the entrance to one of the New Seven Wonders. Emperor Shah Jahan commissioned the erection of the legendary mausoleum for his beloved wife Mumtaz Mahal. As with all matters related to love, the Taj Mahal is something to be experienced, not described. Entry to the Taj is based on a two tiered system with differing admission prices. If you appear to originate from the Indian subcontinent you pay one price and if you appear to come from elsewhere you pay a price approximately twenty times higher. The rationale behind the higher price is that it will either restrict the number of pollution inducing tourists who come to visit or provide funding for the upkeep of the site. On the bright side, people who look like foreigners are provided with a small plastic container of bottled water to quench their thirst and cute booties to protect their feet. After a late lunch and a demonstration by local craftsmen of their marble inlaying skills, we went to the Agra Fort. A family had gathered together to pose for a picture in one of the fort's many courtyards. Stein was standing near them. The family member taking the picture was gesturing towards him. Stein's pasty complexion made him a novelty for Indians who wanted him to appear in their photographs, so he moved closer to the family. The man motioned again, but this time waving to Stein in the other direction. Stein had made an incorrect assumption and was not welcome in this family photograph. One of the merchants who hawk goods to unsuspecting visitors in front of tourist attractions offered to sell us a whip. Excited at the possibilities, we negotiated the price down to something that seemed reasonable and decided to purchase it if it was still available once we exited the fort. Unfortunately we were beaten to the punch and never got our hands on it. The expiry of my contract with Satyam coincided with the last day of work for my roommate Stein. After wrapping up our professional obligations we decided to meet up in New Delhi, the capital city of India. From here we would embark on a great North Indian trip spanning multiple states and modes of transportation. Stints in Delhi would bookend our trip. Soon after our arrival we visited Rashtrapati Bhavan, the presidential palace, and the other Parliament buildings of the largest democracy in the world. We then drove down the majestically broad thouroughfare of the Raj Path to India Gate, a memorial to soldiers. Of India's major cities, Delhi has the highest number of historical sites to visit. The Qutab Minar complex houses the tallest brick minaret in the world. The Lotus Temple, a Bahá'í House of Worship, is a fairly modern architectural marvel with its petal shaped design. Completed in 1986, it bears some resemblance to the Sydney Opera House. Along the banks of the dried up river Yamuna in Old Delhi, lies the Red Fort or Lal Qila. Constructed by the Mughal Emperor Shah Jahan in the 1600's, it is still in spectacular condition. Protected by a 2.5 km long wall, many of the marble buildings inside are off limits to the public. The Diwan-i-Am is the imperial courtyard where the emperor honoured the public with his royal presence. It is also the former location of the fabled Peacock Throne, which has an estimated value of $1 billion USD were it still to be in existence today. It was not long before stomachs began to rumble under the midday sun. A cycle rickshaw through crowded back alleys led us to Karims, a meat lover's delight. We savoured a meal of kebabs and biryani at this famed restaurant before continuing on to the Jamma Masjid. India's largest mosque boasts a courtyard that can hold 25,000 worshipers at the same time. Delhi's shopping scene also offers great variety. From the shining new malls of Noida to the heritage circles of Connaught Place, there is something for everyone. At Connaught Place, or CP for short, we reunited with the final third of High Street's trio of roommates - Joe. My shoelaces were untied, so Joe kindly tied them up. He had also been journeying across India and we shared a hearty meal before we went our separate ways. Stein and I also visited the upscale Khan market and the seedy Palika Bazaar, an underground market where my European companion was swarmed by merchants eager to sell him dirty videos and magazines. Sightseeing and shopping completed, two activities remained before Stein had to fly off to his homeland. When he had visited Mumbai, Stein had dubbed several scenes for singer Himesh Reshammiya's debut film Aap Kaa Suroor. We went to the movie theatre to see, or rather hear, him in action. The last item on our itinerary was a visit to Asia's top restaurant - Bukhara. Offering fine cuisine from India's northern frontiers but no cutlery, the food was immensely tasty. One of my hobbies is creating structures using empty juice boxes as the building blocks. As a child I enjoyed playing with LEGO, but as the years passed I graduated to using more innovative materials. I discovered I was not alone when I attended Canstruction Vancouver at Canada Place. A fund raiser for the Greater Vancouver Food Bank with the motto "It starts with one can. To feed the hungry. To lift the spirit. To change the world", entry to Canstruction was via donation. Instead of juice boxes, cans were used to create a plethora of sculptures ranging from Winnie the Pooh to a printing press. Experienced judges, as well as the general public, decided on their favourites in this internationally acclaimed design competition. I took a 3 hour bus ride to Rameswaram from Madurai. Rameswaram is a town located on an island off the coast of the tip of mainland India. Sri Lanka is visible in the distance. It is here that the hero of the epic Ramayana is said to have built a bridge to the island nation to retrieve his lovely wife Sita from the clutches of her captor Ravana. It is not hard to imagine, as a clearly visibly chain of odd looking undersea rocks head towards Sri Lanka. This is known as Rama Setu or Adam's Bridge, and it can be seen through the turquoise water. Rameswaram is accessible by land from India by another magnificent bridge - the 2.3 km long Pamban Bridge. The ghost town of Dhanushkodi consists of deserted and decaying buildings, the surviving remnants of a devastating cyclone. Simultaneously surreal and beautiful, it can be reached by catching a ride on a mini-bus full of stinky fish(ermen). The other highlight of Rameswaram is the Ramanathaswamy Temple. Here I was drenched with water from 23 sacred wells, each containing water from a different sacred river. I drank from each well to ensure they had distinct tastes. Although most of my trips were in groups or pairs, there were a few solo trips. These are enjoyable in a different way, as the solo traveler has unlimited freedom to spend as much or as little time as they want at any particular site of interest. He has to be responsible only for his own safety and well being, without having to worry about fellow companions. A trip to the temple towns of Madurai and Rameswaram in the state of Tamil Nadu provided one such opportunity for personal exploration. Following a reasonably comfortable overnight bus journey from Bangalore, I arrived in Madurai early in the morning. After securing a room in a hotel with a rooftop restaurant that offered a view of Maduria's crown spectacle - the Meenakshi Temple - I headed for the landmark itself. Once inside the temple I wandered around before relaxing by the pool at the centre. I narrowly avoiding being crushed by one of the elephants that bless devotees, before walking around the outside of the temple to view its many intricately decorated gopurams (towers). I continued on to the Thirumalai Nayak Palace, which was built in the 1600's with the help of an Italian architect. An amalgam of Indian and European architectural styles, I walked into a movie shooting upon arrival with dozens of colourful dancers moving around in unison amongst drapes hanging from the ceilings. Several other onlookers and I were quickly ushered away by the local authorities so that we would not appear in the movie as unpaid extras. Later I found out that movies such as Bombay and Guru had scenes filmed here also. Madurai is also the place where Mahatma Gandhi first donned his famous loincloth, A comprehensive museum traces his life and the history of India from the its time under British rule to its freedom. Several of Gandhi's personal belongings are also on display as well and an adjacent library houses copies of his many letters and other writings. Several other temple visits, monkey encounters, and a rooftop meal rounded out the day. According to ancient lore, since the origin of the game the names "table tennis" and "ping pong" have been used interchangeably for this high intensity sport. In modern times most professional players like to say that they play table tennis while recreational players are fine referring to the activity as ping pong. 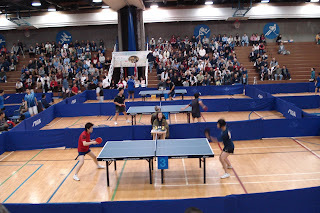 During the summer, I went to the Canada Cup Premium - Greater Vancouver Open Table Tennis Championships hosted by the Canadian Chinese Table Tennis Federation and organized by Table Tennis Canada at the British Columbia Institute of Technology (CCP-GVOTTC presented by CCTTF and TTCAN at BCIT). The BCIT gymnasium was filled with around ten table tennis boards with furious action taking place at all of them among contestants of different age groups, skill levels, and gender types. There were bleachers on each side upon which the spectators sat watching the ping pong balls whiz past their eyes. As time passed and players were eliminated from the competition, the number of tables began to rapidly shrink until there was only one table left. The largely homogeneous audience, which had up till now been evenly distributed, also compressed itself into the central bleachers so that they could catch all the fast paced action. The Canadian champion lost to one of the top ranked players in the world - Chen Weixing, but not before putting on an entertaining show. A study came out recently with findings that were good news for some and quite disconcerting for others. Researchers focused on a group of 82 married couples who were rated on their appearance and encouraged to talk about the health of their relationship. The primary finding was that "men's attractiveness appeared to be more detrimental than beneficial to marriage", or as media outlets around the world put it - "The secret to a successful marriage is an ugly husband". If the wife must be more attractive than the husband, then the ARNABride would have to be exceedingly beautiful to outshine my luminescent countenance. She would have to be an ARNABombshell. This is not only consistent with the ARNABabe framework but strengthens it with further scientific backing. Another of the findings could explain why the search for potential ARNABride candidates has not made any meaningful progress as of this date. "Attractive men have available to them more short-term mating opportunities (ie ARNABabes). This may make them less satisfied and less committed to the marital relationship (ie ARNABride)." I came upon another article of interest in the media. India Infoline mentions "Arnab looked like a heartthrob with his new look and swept the audience off their feet", most likely alluding to the newest incarnation of the ARNABeard and my loyal readership.